The atmosphere was electric as almost sixty guests arrived on a typically hot Lowveld day to share in this momentous occasion with founder, Lente Roode, and the team here at HESC. Open vehicles departed from the Centre to the nearby airfield, where the release was scheduled to take place. We also decided to release one wild cheetah and one hand-raised one. This was in an attempt to – have the best of both worlds – a cheetah that knows how to fend for itself in the wild, and one that is familiar enough with humans to allow the monitoring team to keep a relatively close eye on its movements. 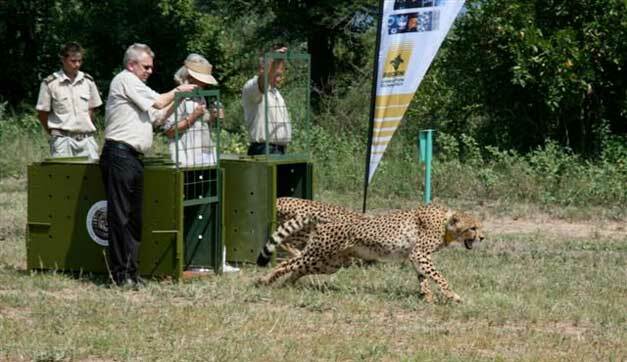 Bechem Lubrication Technology – a German corporation that specialises in lubrication and equipment, sponsored the two very costly cellular tracking collars that were fitted to the cheetahs so that their whereabouts could be tracked. Another generous sponsor was Amarula. They created a true African bushveld celebratory atmosphere, not only on the day of release, but also on what turned into a birthday celebration weekend. Amarula also gave each of HESC’s contributing partners a gift pack as a token of appreciation for their involvement. Spectators withstood the blazing heat as they waited in anticipation for the two feisty cheetahs be freed. Their patience was soon rewarded when Mrs Roode and Attie Vorster (Managing Director of Bechem) did the honours of opening the cages and setting the animals free. Habana, the wild cheetah, wasted no time at all in darting to safety and quickly disappeared into the dense bush. Khula, the hand raised cheetah, preferred a leisurely stroll among the astounded crowd before leaving. Clearly he was not quite ready to say goodbye. Needless to say his close proximity caused more than a few spectators to hold their breath as he slowly made his way up the road. Fortunately the HESC team was close at hand and quickly took control of the situation, calling on one of their curators to lead Khula away from the group. Once the excitement had finally died down the guests were transferred to Camp Jabulani, where a feast of delicious snacks and refreshments awaited them beneath the shade of the Acacia trees. They were then treated to a close-contact encounter with Camp Jabulani’s elephant herd, which also owes its existence to HESC. It was an apt setting indeed for guests to meet Sebakwe, Amarula’s elephant mascot. He has graced many a magazine and television screen around the world as part of the Amarula brand. How are the cheetah’s doing? The cheetahs have both been found since their release, although they do not appear to be staying together. Habana has already enjoyed some hunting success, and was found shortly after his release with a bulging belly and the remains of a three day old bushbuck. And despite having a slow start, we’re proud to report that Khula caught a small warthog on the 1st of April.